The creativity study group came together out of a shared interest in the creation and appreciation of art. Many members engage in painting, drawing, collage, dance, photography, music, and writing. All of us are intensely interested in the processes and products of those pursuits and in the effect of our deepened understanding of the artistic process on our capacity as therapists. For example, while we might purposely and productively pair the movie Toni Erdman, about a father-daughter relationship, with a case presentation on family therapy, our discussion of the film also would always go back to something more essential — what group member Allan Melmed called “an underlying theme of what is genuine, what constitutes a sense of self.” And it is that search that has led us to read authors who have explored these issues such as Heinz Kohut, Carol Press, George Hagman, and Carl Rottenberg. Kohut saw optimal child development as including the child’s experience of herself as “the gleam in the mother’s eye” – the sense that she is valued in her attempts to investigate the world and express her idiosyncratic visions. She reaches out to the world, fueled by a grandiosity and omnipotence that, if welcomed by her caretaker, gives energy and vitality to her quest. The undeniable pleasure in the experience of being a valued self becomes the basis for healthy narcissism. Kohut believed that this early narcissism was gradually transformed into creativity, empathy, a capacity for humor, and wisdom. The idea that a more complete sense of self can be realized through creative endeavors has been central to our group’s understanding of the significance of the creative process in our lives and in the lives of our patients. Implicit in these descriptions is the idea that creating is an intersubjective experience. Rottenberg and others have written about the importance of the imagined viewer, the invisible other, during the experience of creation. These authors contend that even when immersed in the artistic process and not consciously creating for an audience, the artist is nonetheless creating in order to be in contact with a receptive response. And, in turn, we who appreciate art in its myriad expression are seeking an encounter that enlivens us, opens us up to greater joy, deeper grief, a more profound sense of beauty that we would not have had without the work of the artist. 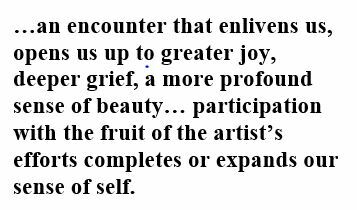 In short, this participation with the fruit of the artist’s efforts completes or expands our sense of self. For the artist, the creative process may ultimately affirm the sense of self, but engaging in this process can also lead to states of fear, or what David Shaddock calls periods of emptiness and restlessness. The engagement in the process of creation, followed by grappling with the artwork, leading to an eventual completion of the product or experience is akin to the rupture/repair sequence in therapy. And just as we hope that engaging in this process with a patient will make the relationship stronger, undergoing the process as an artist results in an almost visceral feeling of settling in the body, of being stronger for having had the experience. Donald Winnicott and Marion Milner speak of the transitional space in which art unfolds, and about the capacity of artists to remain somewhat fluid in their experience of their inner and outer worlds. The creativity group has experimented in sharing this transitional space as we spend one evening a year making art together. While those of us who mess around with art materials may have been initially more comfortable than others, the willingness of everyone to plunge in has emerged as we have come to know and trust each other. The ground for me is always leveled because I inevitably start every creative endeavor with the sense that I don’t know what will happen, that perhaps nothing will happen, or that, as Gertrude Stein said, maybe “there is no there there”. This of course mirrors the initiation of many therapeutic endeavors. Intellectually I know this blankness is a good place from which to begin. It can be what Shunryu Suzuki describes as beginner’s mind – an open, attentive, receptive state of mind, as free of preconception as possible. But in the moment, what I often feel is simply fear. Perhaps fear of the blank page is one reason I am drawn to assemblage and collage. For me, everything is collage — scraps of memories, pieces of nearly forgotten hurt, slips of happiness torn from mixed experiences, unexpected patterns emerging. In my work as a therapist I listen for rhythms, patterns, hidden bits, am witness to something fresh when areas of familiar darkness are ripped away. As a poet, I search for tight images that, when combined, create a crisp truth composed of newly relating parts. So it makes sense that in art I enjoy interacting with my materials: handwriting from my parents’ letters, slips of paper torn from one image to create another, words in one context that gather heft in a new setting. In all of these endeavors, what might seem old, broken, plain, or lost may be reborn — surely a testament to possibility. Of the varied art experiences in which our creativity group has engaged, one that seemed to speak to us most forcefully was constructing boxes in the manner of those created by Joseph Cornell. Cornell’s father died suddenly when he was 14, changing his life forever. He became a loner, lived his whole life in his mother’s basement, and created little worlds of assemblage within the boxes he carefully constructed. He roamed the streets of New York, his artistic eye on the lookout for articles discarded by others which, when juxtaposed to other elements of his choosing, became infused with new meaning which not only expressed some part of his psyche but also offered an invitation to the viewer to visit his or her own inner world. Having read an article about Cornell, our group set about making boxes. To begin, we each selected a box from those I had collected, but in the intervening month before we met again, some members replaced their initial box with one having different properties, as they amassed the fragments that would create a “box of the self.” Adam Phillips writes of psychoanalysis that it “aims to restore the artist in the patient, the part of the person that makes interest despite the early environment. At its most extreme, for the artist of her own life, it is not so much a question of what she has been given but of what she can make of what she has been given.” Phillips is writing metaphorically, but I experienced the artistic process of which he speaks both as I gathered shards of my history to create my box, and as I viewed the rich variety of others’ boxes and listened to group members’ words. John Gualtieri recently wrote about his creation and has given me permission to share his thoughts and pictures of his box. The group was transfixed by this box. 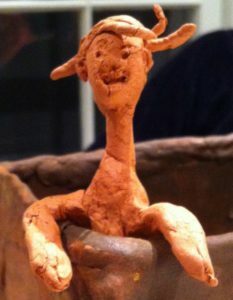 We looked down at the little people inside – viewing them was a poignant experience of tiny parts of selves sitting alone in the bottom of the world John had created. He gradually moved one of the figures around so it finally ascended to the top of the enclosure. It appeared to take some measured joy in both seeing and being seen. 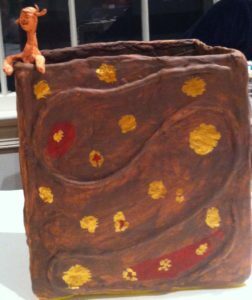 When John later read us a poem he had written about being shy, this small figure peering over the edge of the box came to mind. I had no idea what I would select for my creation until I rummaged through a disintegrating box I had transported from my parents’ house and left unopened for years. In it I found a postcard postmarked December 2, 5 PM, 1913, a faded photograph of my grandfather sitting straight at the wheel of an open car, and an old letter with this sentence in it Yesterday was a record breaking day in Cleburne in that the temperature was 101. 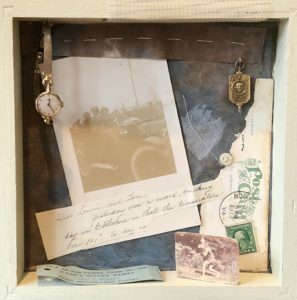 I tore and scattered parts of these images, sewing some of them in memory of my mother’s ever-present needle; I dangled my father’s college Buskin Club medal near a tiny broken watch of my mother’s. Beside the label from Cash’s Woven Name Tags which my aunt must have used as she got me ready to go with her to dance camp, I included a little picture of myself wearing a leather tunic and playing a pan pipe at that camp. The viewer sees everything through a sort of scrim, since the memories seem to come forward when lit by an inner spotlight and disappear when the stage lights of the present return them to shadow. 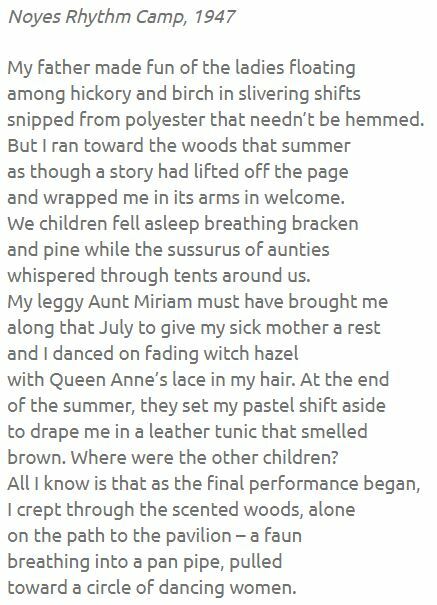 Making the box and writing the poem opened up an image of myself I had never felt as acutely – that of a nearly naked, barefoot, only child in a strange woods who nonetheless feels safe, and counts on being welcomed into an open circle of women. Although unarticulated, this sense of vulnerability amidst the probability of human comfort has carried me throughout my life. And it may be a reason I am in this profession and a hope I am sometimes able to offer to my patients. Through our explorations, group members have, at moments, entered a warm world of shared meanings. We have come to understand, experience, and believe in the vitality of the creative process as it expands our sense of ourselves and offers new possibilities for being in relation to our patients, communicating with the leading edge of their often hidden artistic and human capacities. Dissanayake, E. (2000). Art and intimacy: How the arts began. Seattle: University of Washington Press. Hagman, G. (2010). The artist’s mind: A psychoanalytic perspective on creativity, modern art and modern artists. New York: Routledge. Phillips, A. (1998). The beast in the nursery. New York: Pantheon. Press, C. (2002). The dancing self: Creativity, modern dance, self psychology and transformative education. Creskill: Hampden Press. Shaddock, D. (2010). The opening of the field: Thoughts on the poetics of psychoanalytic treatment. Psychoanalytic Inquiry: 30 (3).